Can you say layers, layers and then more layers for this beauty? 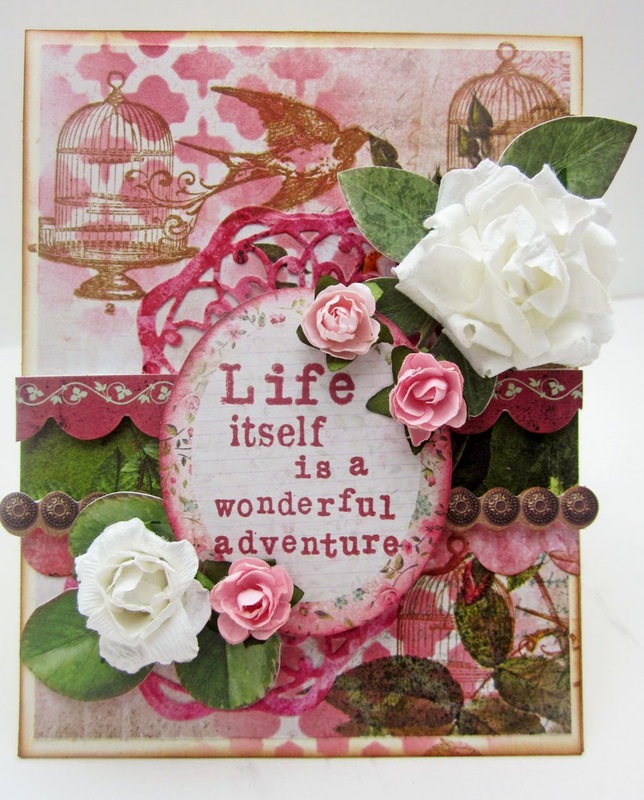 I love adding layers to my card various designer papers, stamped images and foam tape. It really makes for a detailed and interesting card. This card certainly takes advantage of those techniques. 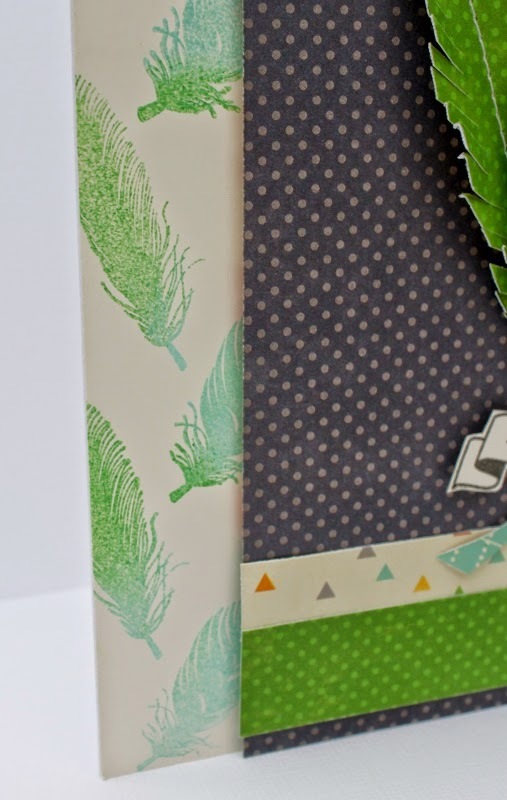 Each of the designer paper elements was double layered on cream colored cardstock and inked. The card itself is 6 x 6 so it gave plenty of room to layer it up. I love the featured oval in the center. That image was stamped on designer paper and then colored in with watercolor pencils. I though the watercolor pencils really gave a soft vintage feel that went with the theme perfectly. 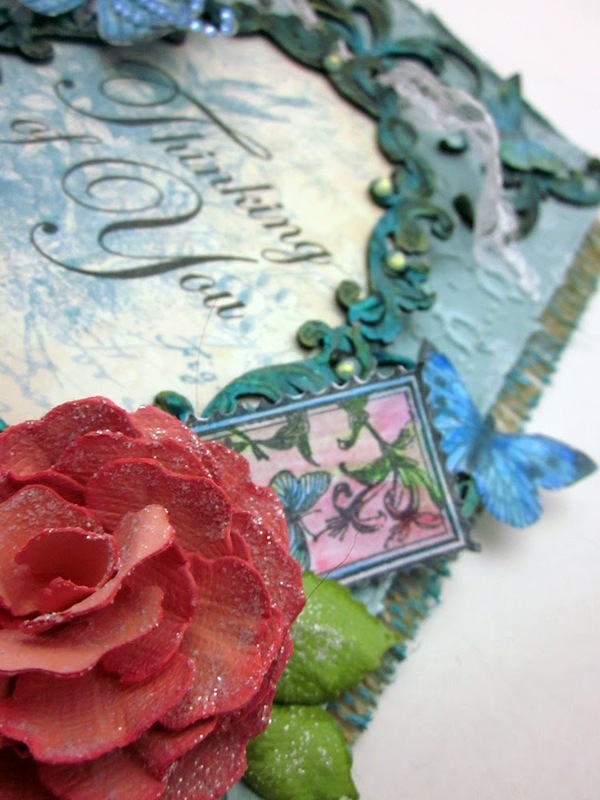 In each of the corners of the card I stamped a tulip flourish for just a bit more detail. It’s always nice to have various elements to draw your eye all around the card. 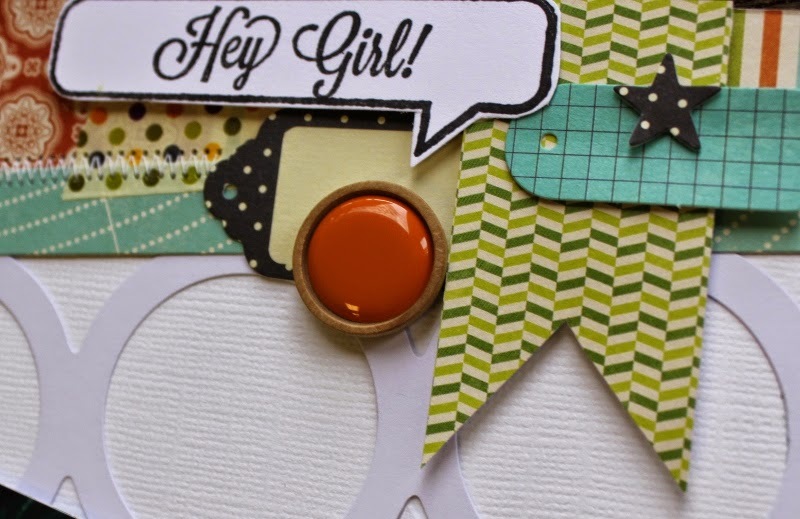 The two mini tags where created by stamping the map stamp on cream colored cardstock and then cutting out into a tag shaped, ink around the edges and then punch a hole in the top and add a ribbon pull. 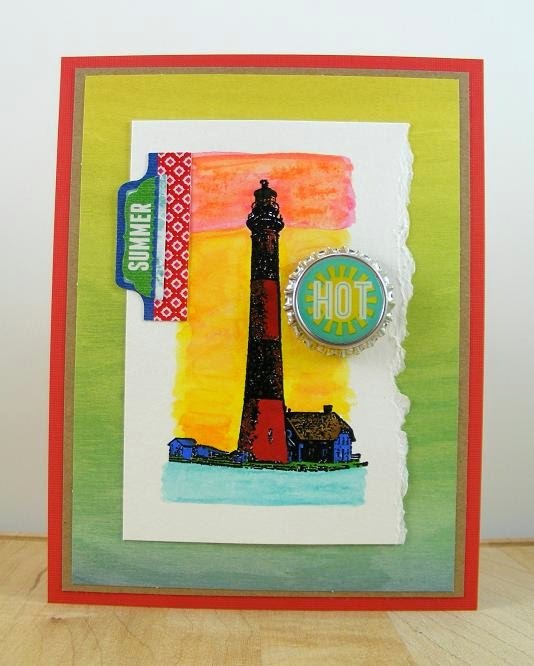 With everything all together this card has great layering and a lot of interest. 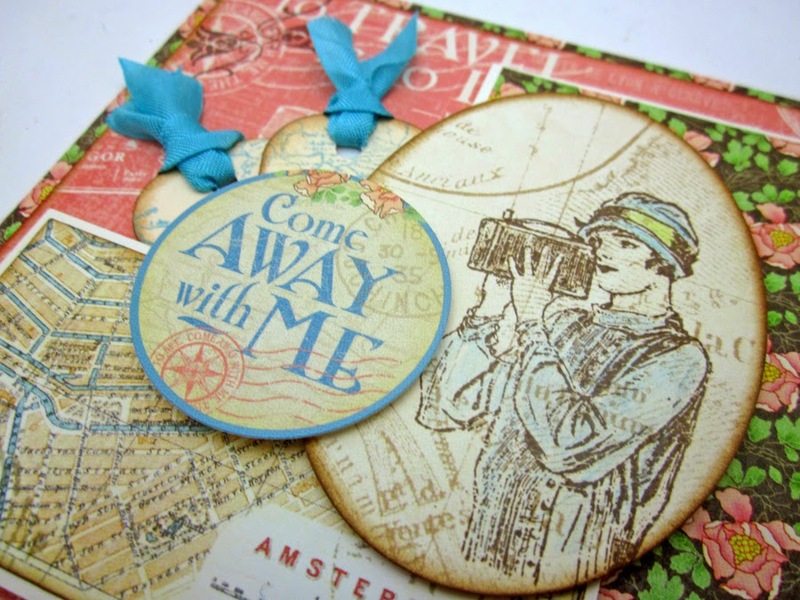 Here are the stamp set I used to create this card: Come Away with Me #1 / ICO308, Come Away with Me # 2 ICO309 and Come Away with Me #3 IC0310. Hello again - thanks for dropping into the Hampton Art blog today! Deborah here with more Halloween treats from Jillibean Soup! Make black card base for a 4.25” x 5.5” card; round right corners of card. 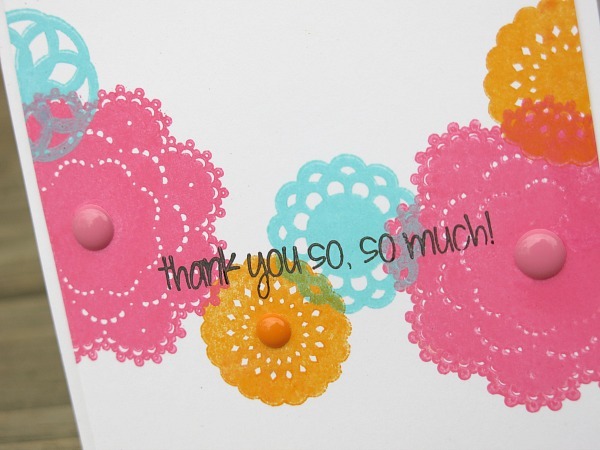 Cut Mini Placemat down to just the stenciled word, round corners and adhere to patterned paper. 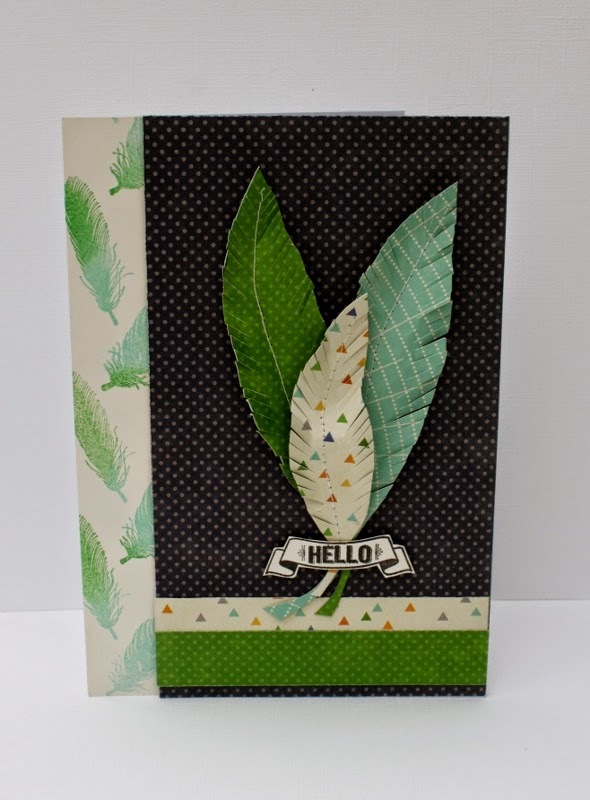 Die cut branch from brown cardstock and adhere to card. Adhere owl Pea Pod Part with dimensional tape and enamel stars letters with Tombo. 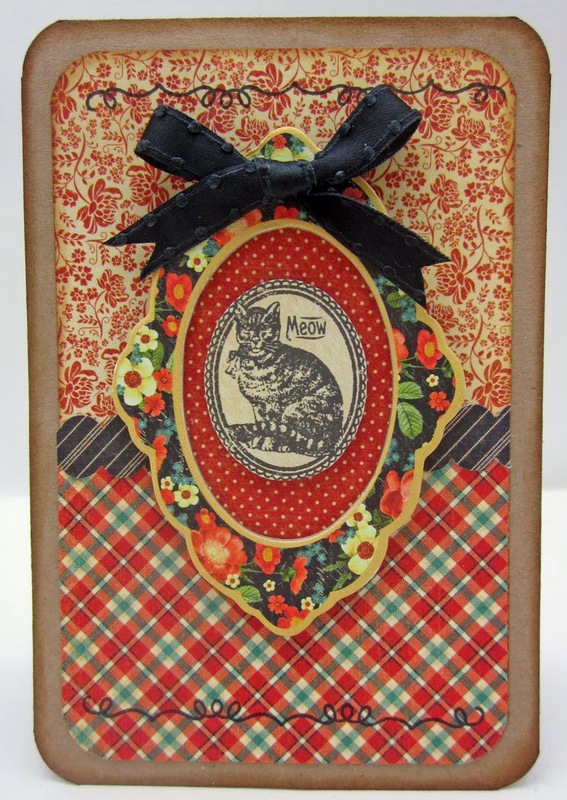 You are so going to love the latest release of adorable stamps featuring Cats and Dogs by Graphic 45. Every animal owners need to be sure to get each of these stamp sets as they are just so stinkin cute. Today’s card uses the coordinating paper from the Cats and Dogs collection, but the star of this card is the stamped cat in the middle. I started off with a Kraft based card, inked and rounded the edges. I then layered two of the designer patterned papers inked and rounded the edges on those too. Next I made a scalloped border across the middle. I added a bit more detail to the top and bottom using the swirling stamp. This is one that I’m finding I’m using over and over again on projects. It just adds that little something extra that every card needs. 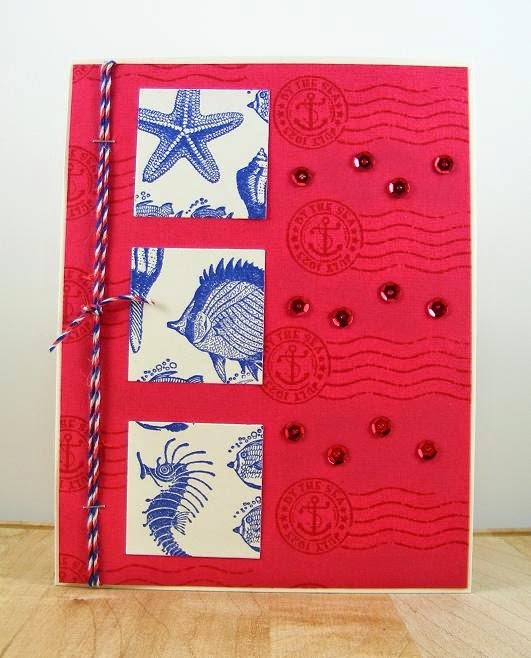 Then the layering begins, I used a piece of chipboard from the collection and backed it with the red polka dot paper. 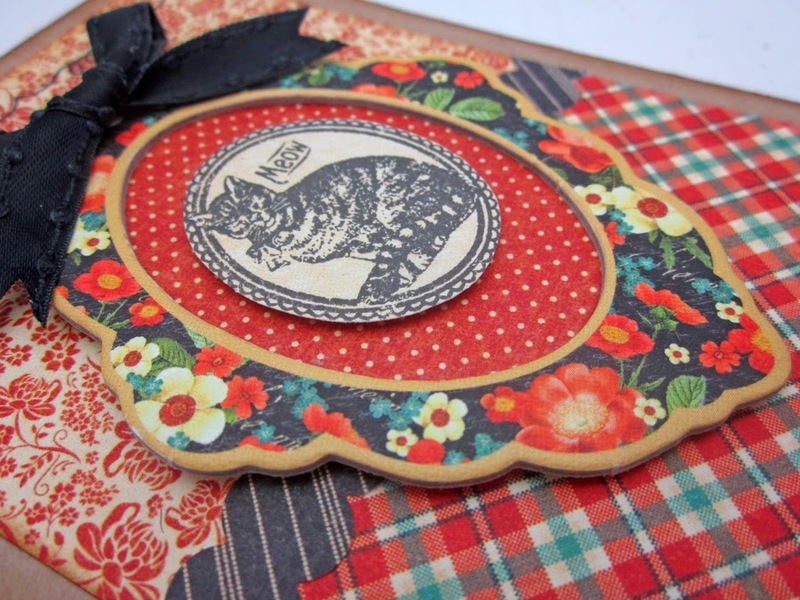 Next I stamped the kitty cameo on some cream colored cardstock and fussy cut out. I attached it with foam tape to the middle and then added the final bow on the top. 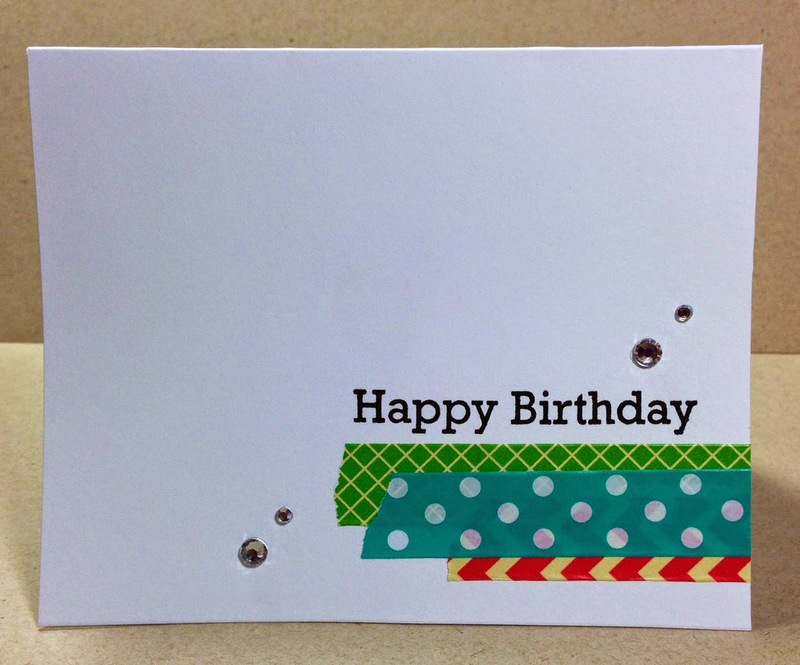 I got a little “green” the other day and used the backing from a package of buttons to make this easy birthday tag. The backing that the buttons came attached to was perfect for a cute tag! It already has a hole in the top and the bottom has a cute scalloped border. No way I could just throw it away! So I covered up everything printed on the backing with some patterned paper in the “Birthday Bisque” line from Jillbean Soup and the tag started taking shape! I added a die cut star and some star confetti (from KI Memories!) to embellish around the sentiment. Then I finished it off with some ribbon at the top! Thanks for looking! Hey, there! Glad to see y'all back here at the Hampton Art blog! I've got a layered card for you today. I don't do these usually, but there are so many fun new products from Jillibean Soup I just couldn't help myself! All products by Jillibean Soup unless otherwise noted. Cardstock: Memory Box; 6" x 6" Patterned Papers: Owloween Stew collection; Pea Pod Parts (die-cuts): Owloween; Chipboard Glitter Alphabet; Accents: Halloween Mini Placemats; Owloween washi tape, enamel star, gems (Recollections); Other: black finepoint pen; Adhesives: foam dimensional dots, Tombo Multi-Glue, Score Tape; Tools: paper cutter, scoreboard, bone folder, corner rounder, Memory Box die. Make base for a 4.25” x 5.5” card. Wrap bottom of card front with washi tape. Cut .25" x 4.25" strip of spider web patterned paper and adhere to bottom edge of washi tape. Cut .15" x 4.25" strip of grid patterned paper and adhere to top of spider web patterned paper strip. Round right corners of card. Cut panel of patterned paper and adhere to back of mini-placemat. Outline interior of mini-placemat with black pen and adhere to card front at a slight angle. 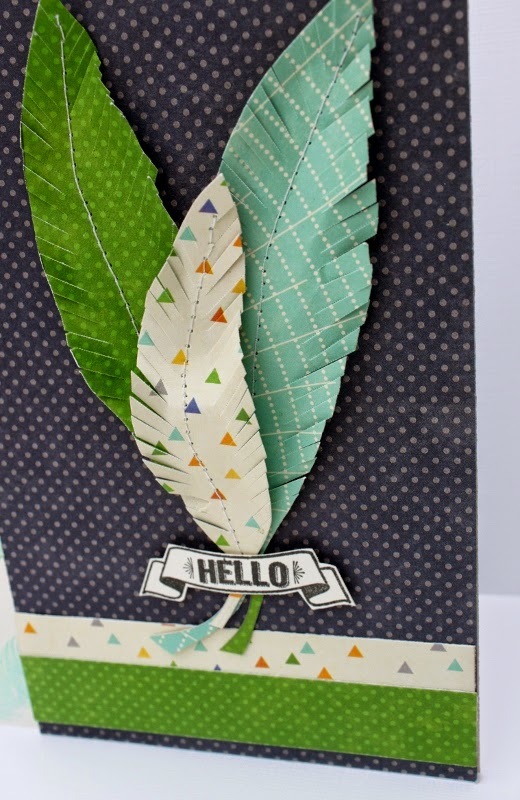 Die cut tree branch and adhere. Cut strips of patterned paper to make "ribbons", cut to a point and adhere to back of cobweb Pea Pod Part; adhere glittery "b" to center of cobweb and adhere entire element to mini-placemat. Adhere rest of the letters. Adhere owl Pea Pod Part with foam dimensional squares and adhere enamel star to hat's center. Thanks for joining us again on the Hampton Art blog. 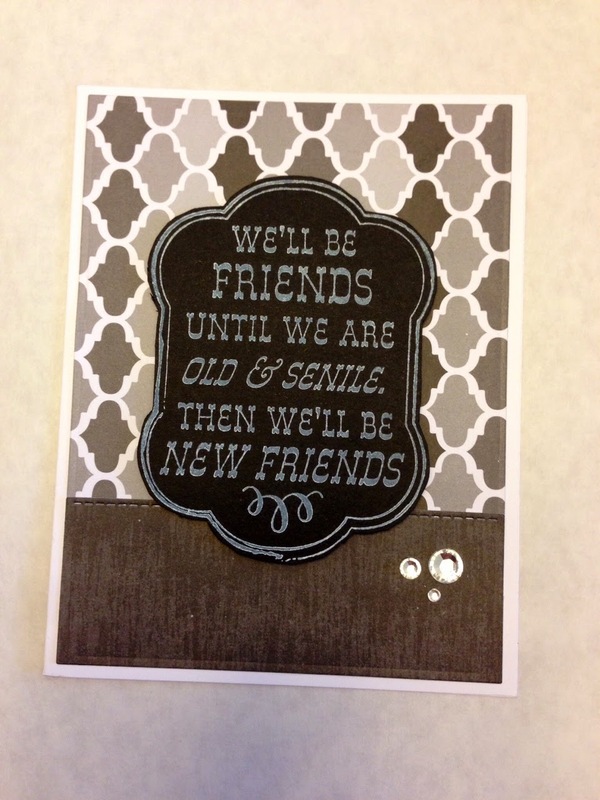 Today I have some girlfriend cards using LOL Laugh Out Loud Stamps / Hampton Arts. These sayings would be fun to send to close girlfriends. I paired them with white ink and black paper for a chalkboard look. 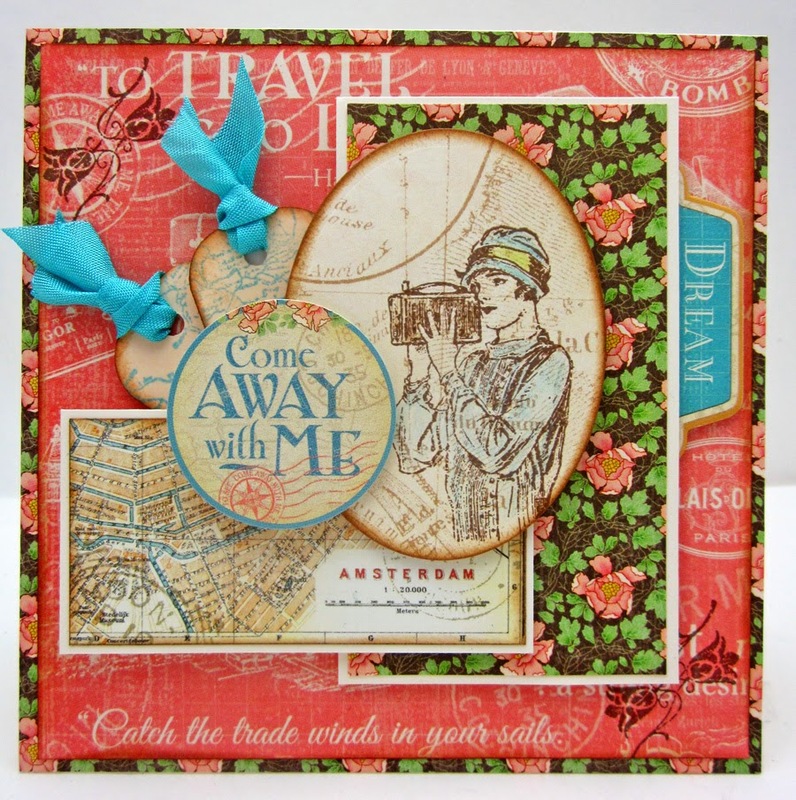 Hello and welcome... it's Melinda with you today and I've been having some fun playing with the new Stamp & Stencil sets, in particular the gorgeous doily stamps. I don't think I could ever tire from using doilies on my projects as they as just so darn sweet and extremely versatile. I used the new 'Label' Stamp & Stencil set which boasts the clear stamp doilies and the woodgrain stencil... honestly it's a perfect combination. 1. Cut and score a piece of white cardstock measuring 4" x 5.5" when folded. 2. Cut a single sheet of white cardstock measuring 3.75" x 5.25". 3. 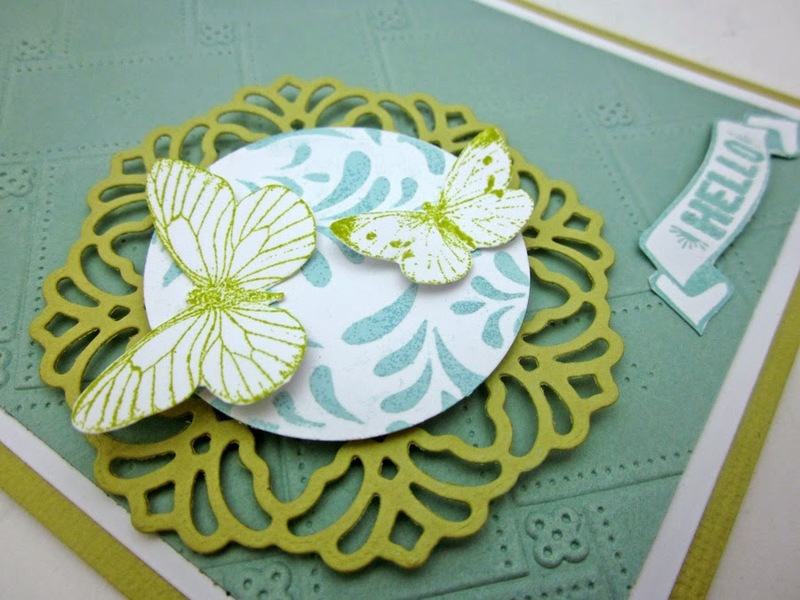 Using a selection of the clear stamps and different colored inks, stamp a collage of doilies in a layered approach (allowing each stamp to dry in between stamping) across the bottom third of your single sheet of white cardstock. 4. 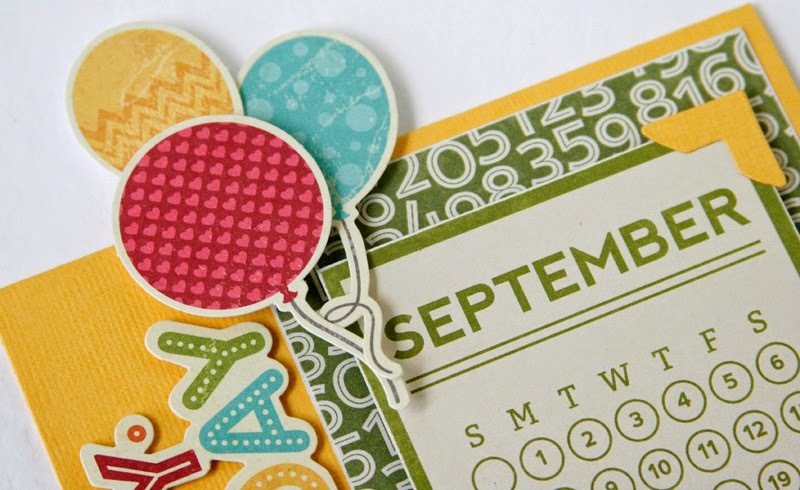 Using black ink, stamp your sentiment across the centre of the stamped doilies. 6. Add epoxy dots in a co-ordinating color to the centre of the main doilies. 7. Using foam pop dots adhere the single sheet of cardstock to the folded card making sure you have even space around each edge. Hi there! 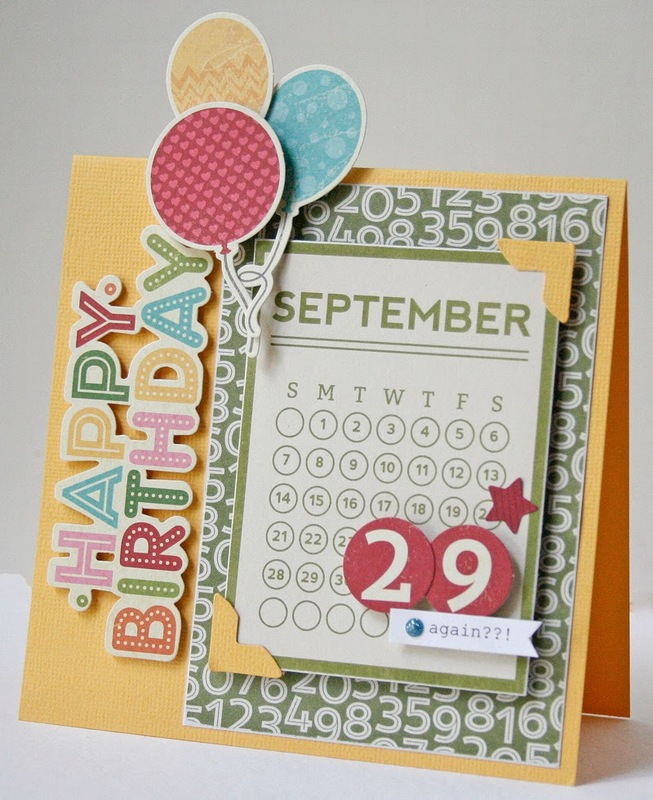 I’m sharing a birthday card with you today using the fun new “Birthday Bisque” line from Jillibean Soup! I made this one with the intent of using it to set on someone's desk at work on their birthday instead of trying to fit it in an envelope to send through the mail. This is a big and bulky card. It's 5.5 inches squared. I used lots of foam adhesive for dimension and the balloons extend way up over the top of the card. It would not fit in an envelope easily! But it is big enough for everyone in the office to sign and it will be easy to spot when the employee arrives at her desk! 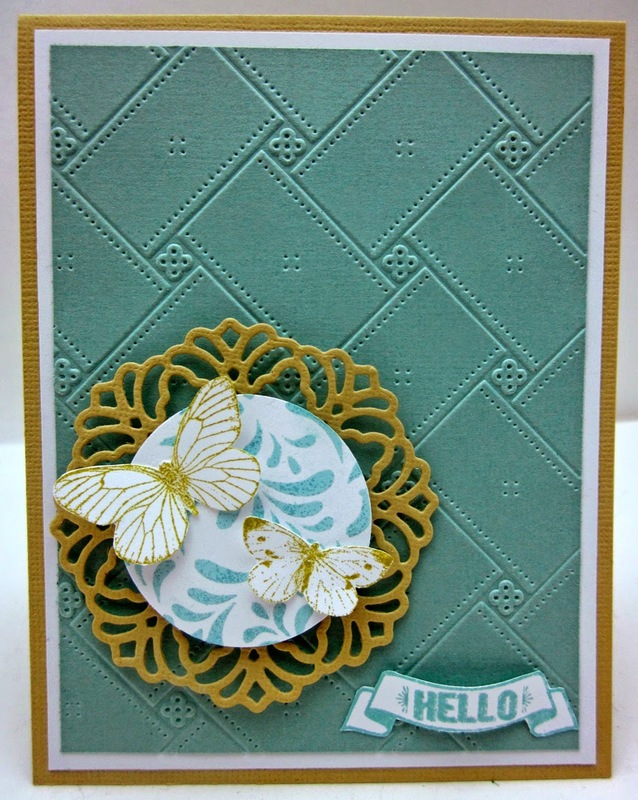 Today’s card is one that is simple yet really highlights the stamped and stenciled embellishments. Sometimes simple can actually be more difficult to pull off that a busy card, you really have to make each element shine. 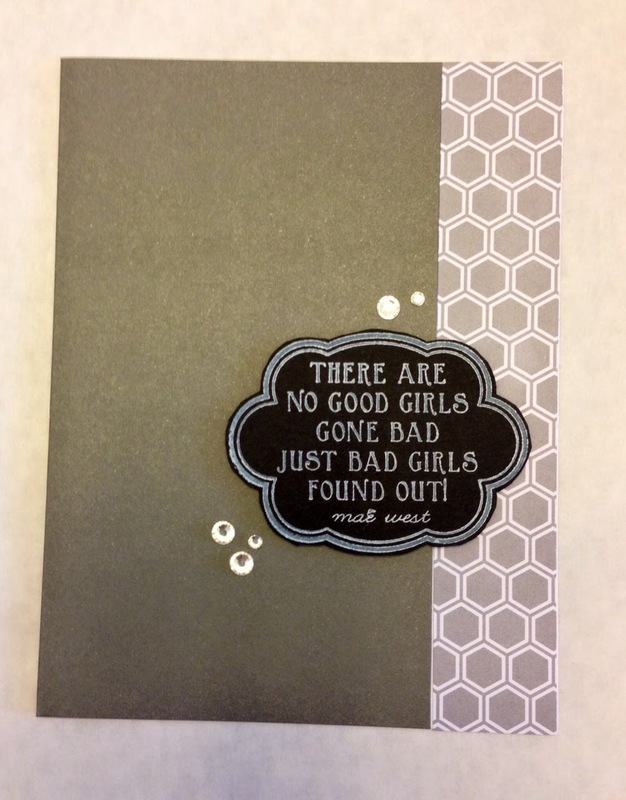 I started off using solid color card stock and embossed with a folder. The next step was die cutting out the fancy flourish/circle. I attached that with foam tape for some texture. 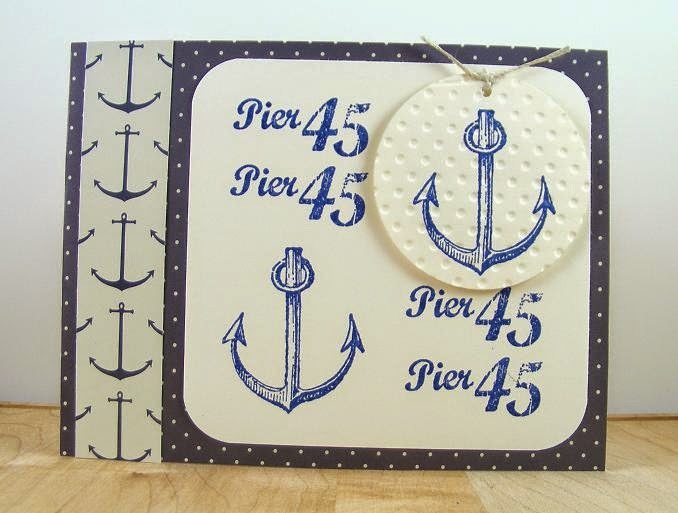 I then punch a plain white circle and used the stencil from the Vintologie Stamp and Stencil set SC 0642. I used pigment ink so the color would be solid and rich. You’ll want to be sure that the ink is good and dry before proceeding on. On another sheet of white paper I stamp the butterfly stamps and from the Graphic 45 Botanical Tea Set IC0296 and fussy cut two of them out. 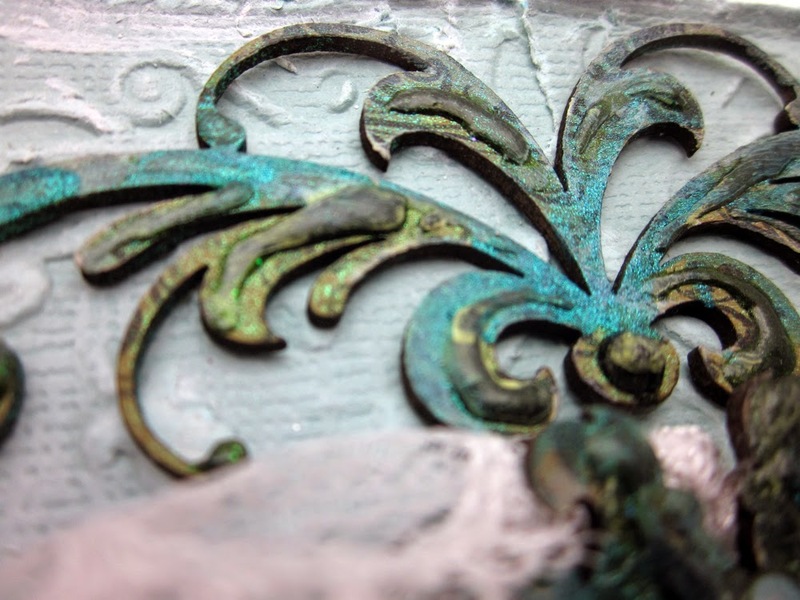 I then glued them to the stenciled circle and added the circle to the front of the die cut flourish. Lastly I stamped the sentiment and fussy cut out. I bowed the banner a bit before gluing it down so it pops off the card. Lastly I layer onto white and then sweet grass green cardstock to finish it all up. 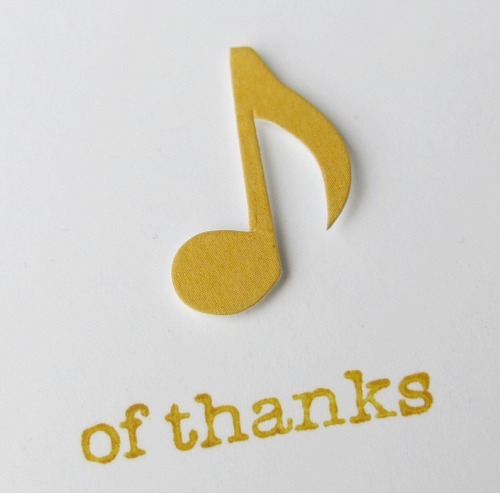 Thanks for stopping by and be sure to come back tomorrow for another great project. 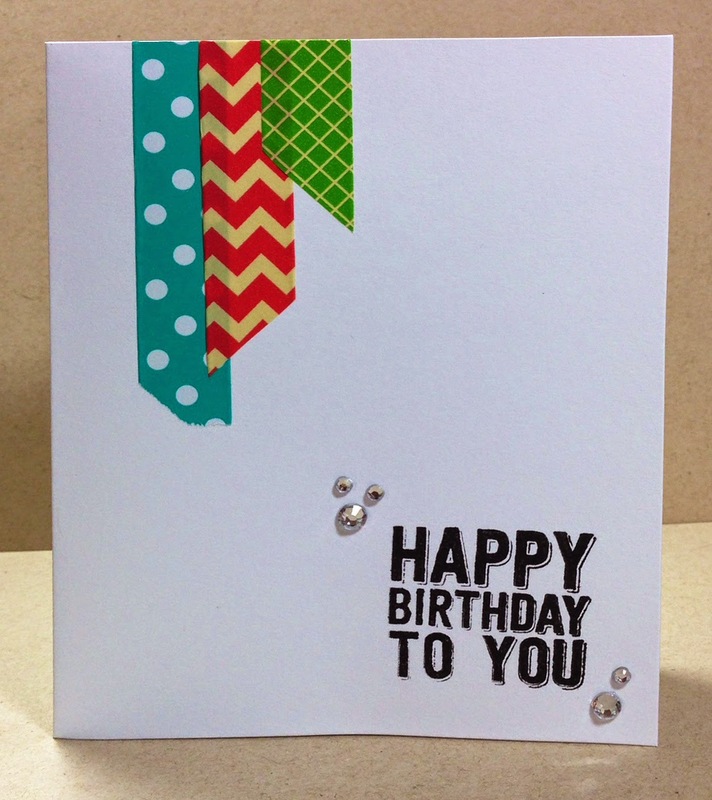 I really enjoy creating cards with lots of layered texture - and today's card really fits the bill. 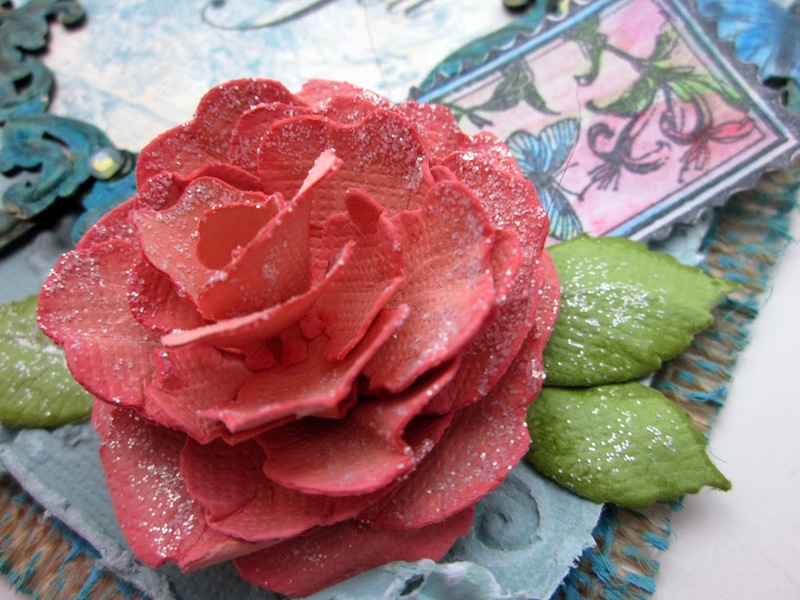 I combined stamps and paper from the Graphic 45 Botanical Tea collection, added some embossing and chipboard and finished everything of with a handmade rose. 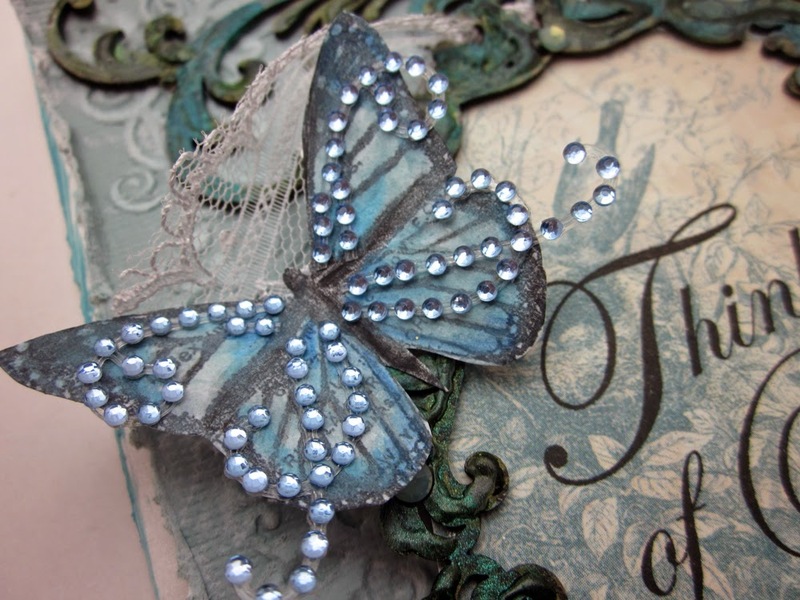 The stamped butterfly really comes to life by adding some crystal flourishes. 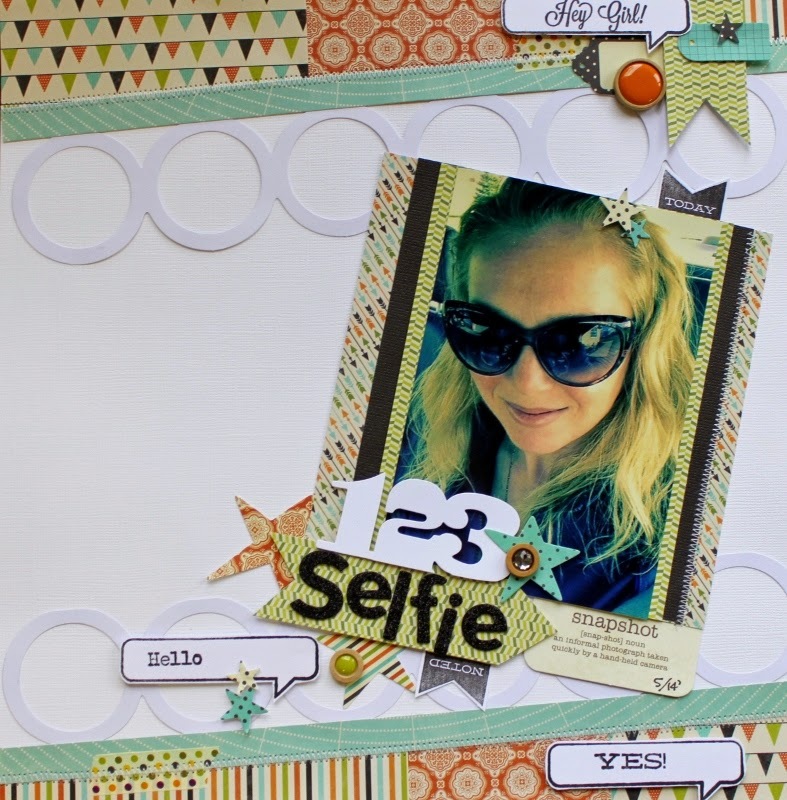 Hi, it’s Deborah here with a card I made using a bunch of new goodies from Jillibean Soup! This may have been the easiest card to make on record because it involves nothing but pre-made pieces and do-dads and a little glue. (Even with all my glue issues, I managed to handle this one without any catastrophes (which is saying something). And cleaning up was a snap (always a bonus)! Make orange card base for a 4.25” x 5.5” card. Cut patterned paper of owls in tree to 4" x 5.25". Cut a purple cardstock matte 1/16" larger on all sides for the patterned paper panel. Adhere PP panel to purple mat and then to card base. Adhere enamel stars, orange photo corners from Pea Pod Parts and googlie eyes. Adhere "Freaky" with foam dimensional adhesive. 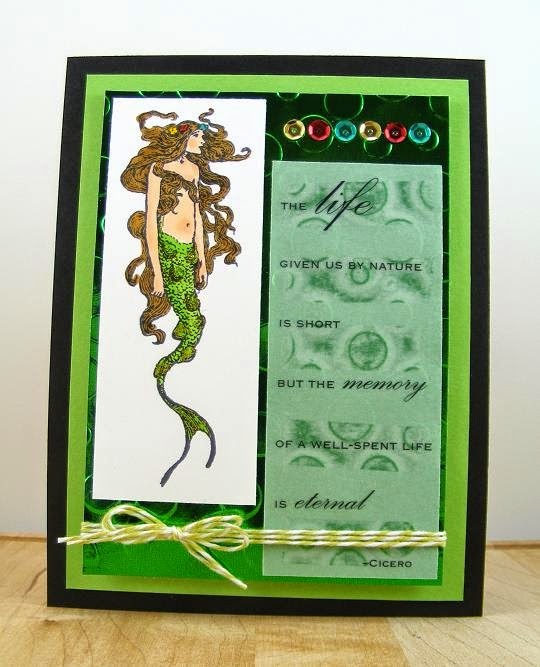 It’s Deborah again, and the card I made for today uses more of the new goodies from Jillibean Soup! This is a quick and easy card for the time-pressured cardmakers out there. Make green card base for a 4.25” x 5.5” card. Cut a 3" x 5.5" panel of star patterned paper from Owloween Stew and adhere to card base; round bottom corners of card. Cut a 5/8" x 5.5" panel of striped patterned paper from Witches Brew and adhere over top edge of star patterned paper. Adhere alphabet letters with Tombo. Adhere cat from Pea Pod Parts with foam dimensional adhesive. Hello and welcome... it's Melinda with you today and I'm sharing a card I created for a child to give to their teacher on the return to school. Now, I have used lots of pink so this card is tailored more towards a female teacher, however you could quite easily use the same approach with a different color scheme for male teachers. 1. 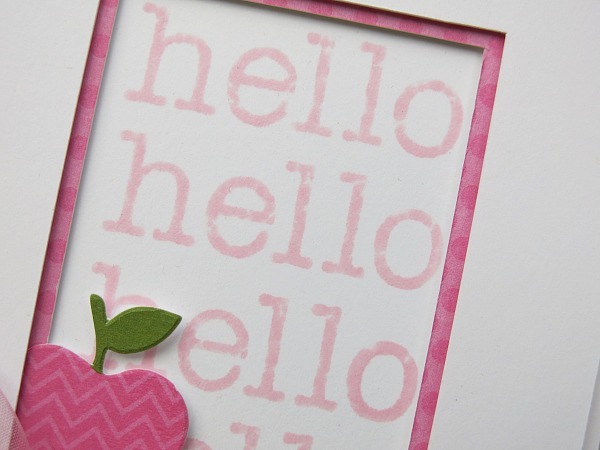 Cut and score white cardstock to create a card measuring 4" x 5.5" when folded and set aside. 2. Cut a further piece of white cardstock measuring 3.75" x 5.25". 3. Measuring 1.5" down from the top of the cardstock and centred - cut out a rectangle window measuring 2" x 2.75". 4. Cut a final piece of patterned paper measuring 3.5" x 5" and adhere using foam pop dots to the back of the white cardstock with the window. 5. Cut out another window from your patterned paper allowing an eighth of an inch border to remain. 6. Temporarily place the above pieces on top of your folded card and using a pencil, lightly trace out the position of the window. Remove the top pieces and set aside. 7. Stamp your sentiment repeatedly down the pencil drawn panel and allow to dry before erasing the pencil lines. 8. Placing a ribbon around your window pieces, tie a bow under the bottom corner of the cut-out. 9. Add the rub-on sentiment so it aligns with the right side of the cut-out window and is centred vertically within the space. 10. Using foam pop dots adhere your window pieces to the folded card. 11. Slide your embellishment between the layers and adhere in place. If you are like me you rarely do layouts with photos of yourself, but now with the popularity of selfie photos we have so many choices that we should be able to find at least one that we like right? Right, so my challenge to you is to also give a selfie photo layout a try. What better way than to pull out some brand new Jillibean Soup Witches Brew papers and embellishments with stamps from the new Sentiments Stamp and Stencil set? Starting out with a white cardstock base I began by adding three coordinating papers from the brand new Witches Brew Halloween mini collection from Jillibean Soup. That’s right these papers are from a “Halloween” collection- but they translate very well into an everyday layout as you can plainly see. I really love the color combo in fact. The papers were added in chunks on the top and bottom of the layout as shown. Then I added a border strips at a diagonal angle on top and bottom to further frame out the center. A 12x12 Simple Circles placemat provided the two rows of white cardstock circles then added into the center. Next I tore off two pieces of washi tape and added onto the border strip, and then using my sewing machine I stitched the border strip edges on one side. 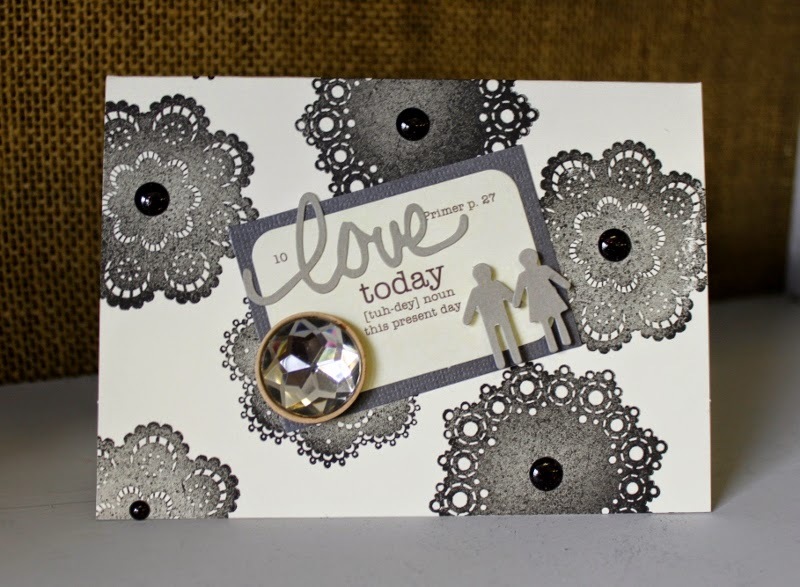 The stamped sentiment bubbles were made with the new Jillibean Stamp and Stencil Set-Sentiments in black ink onto white cardstock. I then cut them out and set them aside to dry. Next I began layering the photo mat with more Witches Brew papers and black cardstock. I added some more stitching to the right side of the photo mat. Next I added my photo with a couple star stickers just for fun. 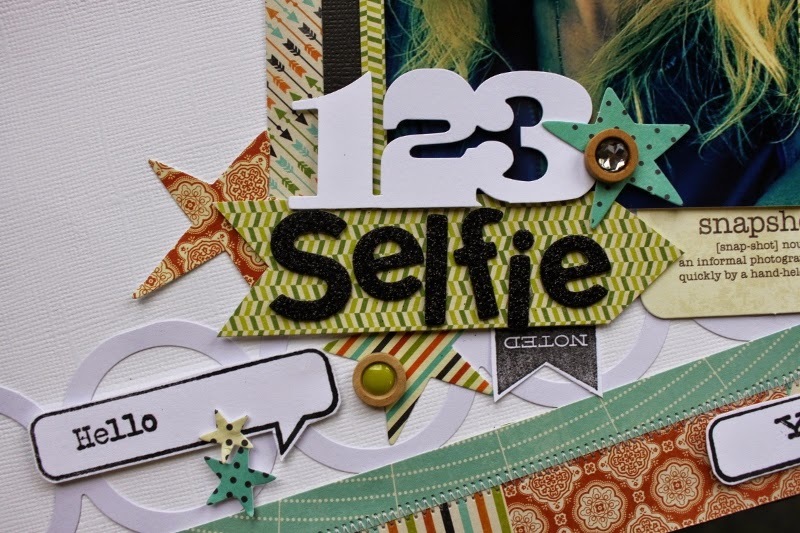 The title piece was created with part of a mini placemat “123” and an arrow from coordinating paper with the fab new Black glitter Beanboard Alphas to spell out “Selfie”- I love these letters! Witches Brew die-cut stars were added with a few wood sprinkles and a snapshot flashcard. 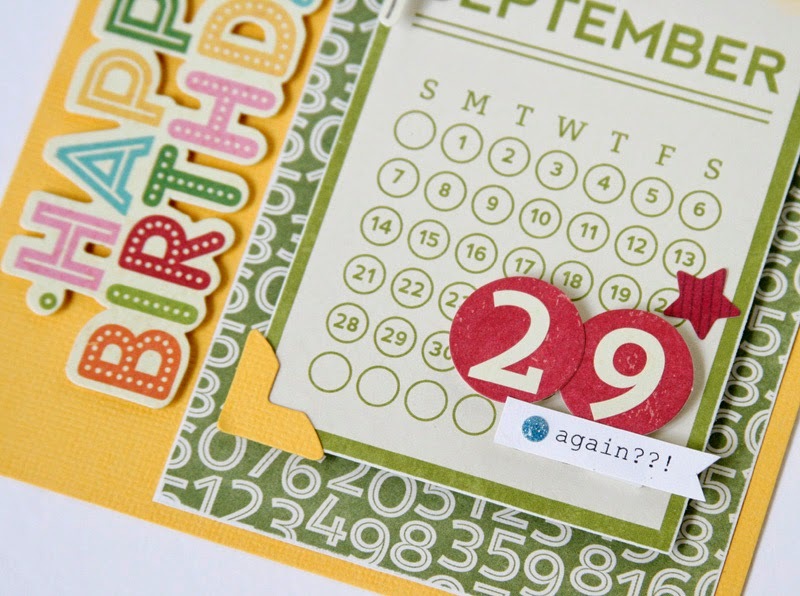 Two more stamped accents were create with black ink, white cardstock and the Birthday Bisque stamp set to make the “Noted” and “Today” tabs. Then I made a cluster at the top of the layout with more Witches Brew papers, a wood sprinkle and die-cuts. Then I layered the stamped word bubble sentiments back onto the page. As easy as 1-2-3, no more excuses it is time to print up one of those selfie photos and get to it. We strive to capture the story of our lives for our families to cherish; those stories are incomplete without photos of ourselves. Hi happy crafters. I hope everyone is enjoying the summer. 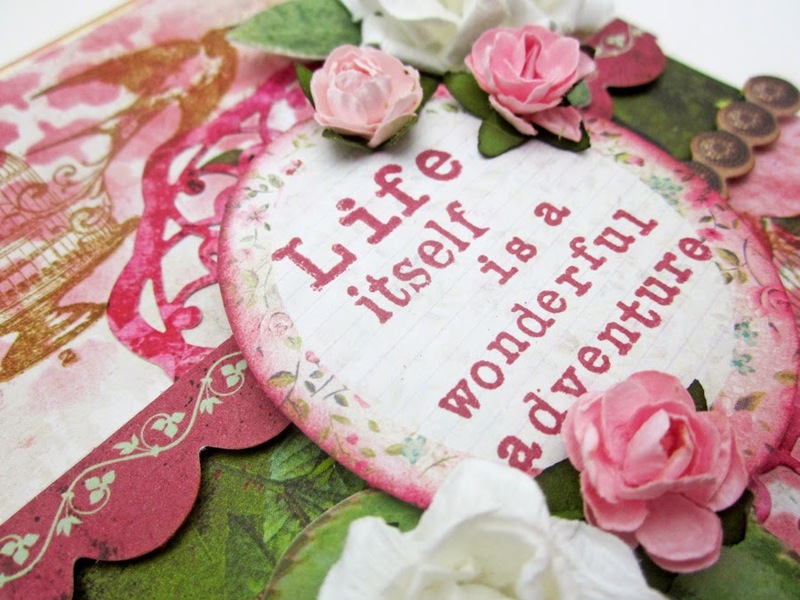 Today card is one that leans towards the shabby chic and Hampton Arts stencils make it so simple to create. Follow the steps below to make a card like this one for that special someone. Cut a base cream card stock A2 size. Cut a sheet of patterned paper 4 x 5 ¼”. Lay the stencil from the Vintologie Stamp and Stencil Set SC0648 over the patterned paper and rub over the top randomly with pink distress ink. Stamp birds and cages randomly over the top of the stencil pattern. Cut a doily die from pink paper. Cut the die in two. Layer boarder stickers across the front and then add the doily to the top and the bottom of the cluster boarders as shown. 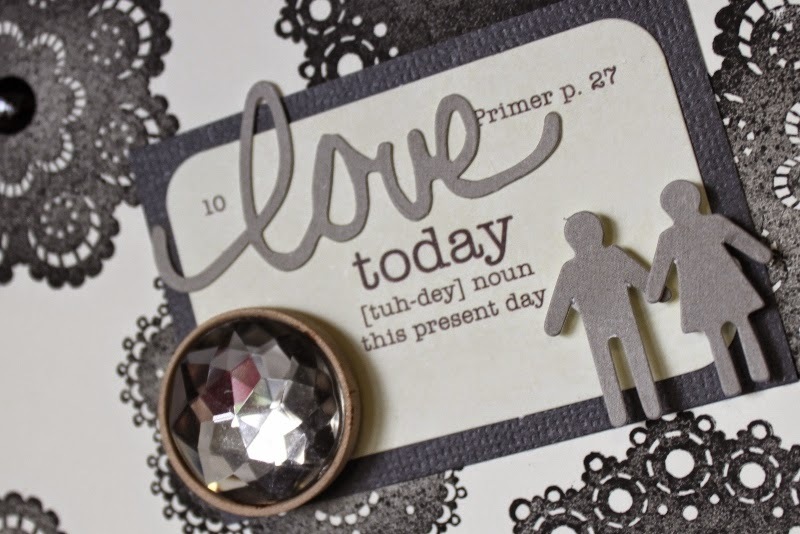 Stamp sentiment in the center of a decorative oval die cut and ink around the edges. Attach to the card using foam tape so you’ll add depth. Finish off the card with flowers and leaves. I love all the “Keep Calm” slogans that are out and about right now and Hampton Art has some of the cutest stamps sets that include “ Keep Calm”. 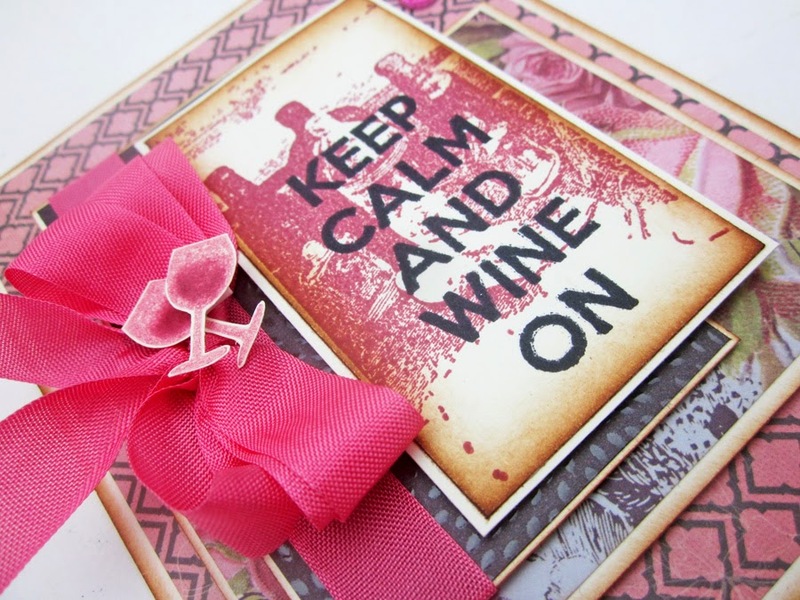 When I saw this stamp set “Keep Calm and Wine On” I knew I had to make a card with that sentiment, LOL. I love it. 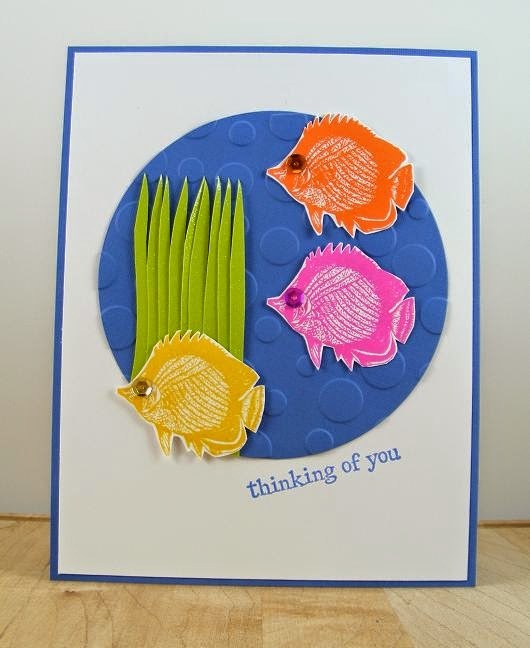 This card includes just a few steps to make so follow along and make your own. 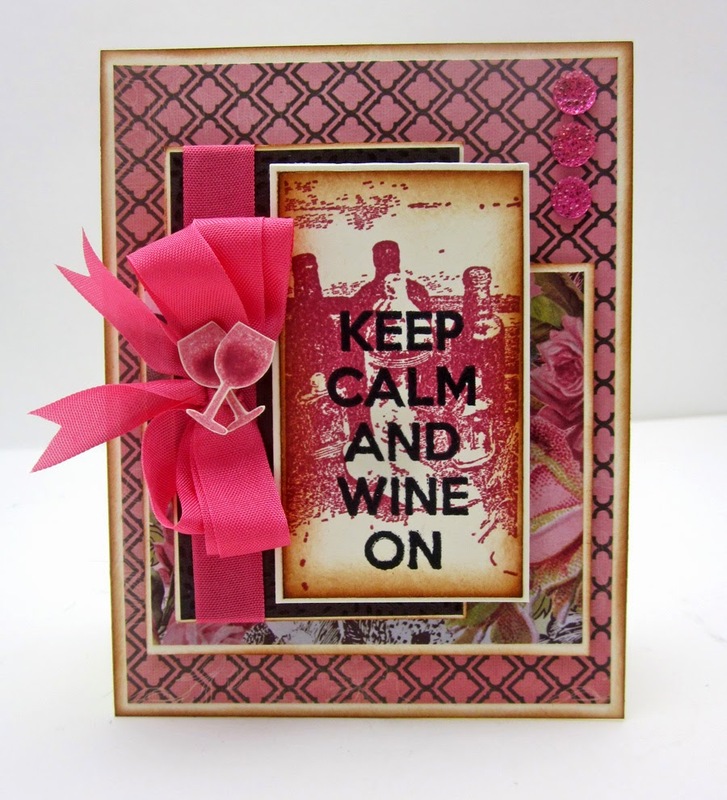 The first thing you’ll want to do is stamp the wine/liquor bottle stamp (Wine PS0820 (J) Block) onto cream colored cardstock in Pink Distress Ink. Trim the image up in a neat rectangle and distress ink the edges with brown. Now stamp the sentiment stamp ( LOL Laugh Out Loud Stamps SC0621) over the top of the bottles in black ink. Mount the stamped image on cream card stock. Cut out two more rectangles in varying sizes one in black and one patterned paper and mount again on cream colored card stock and ink the edges of the card stock. 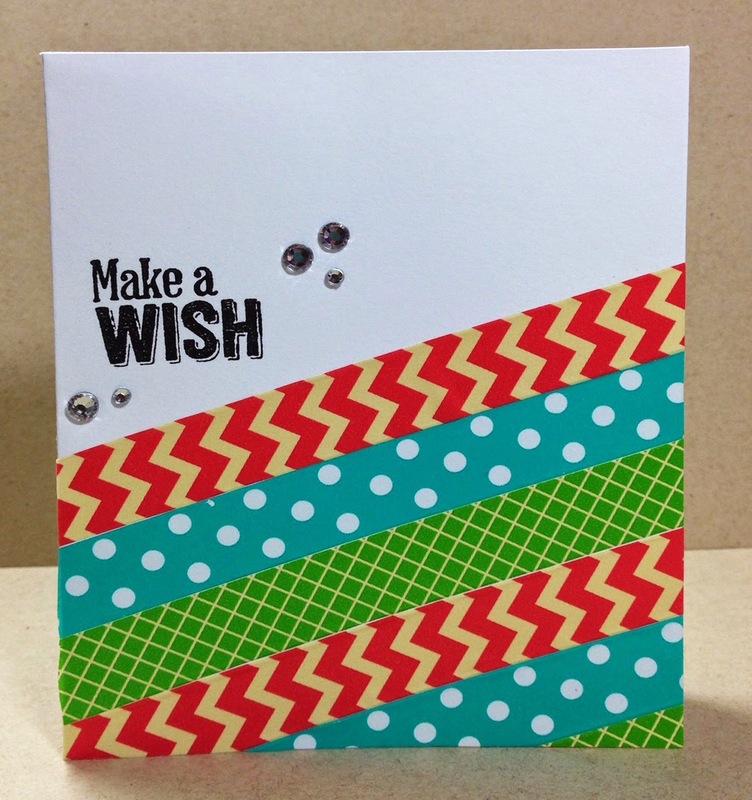 Cut a base card A2 size and add patterned paper to the card 4 x 5 ¼”. 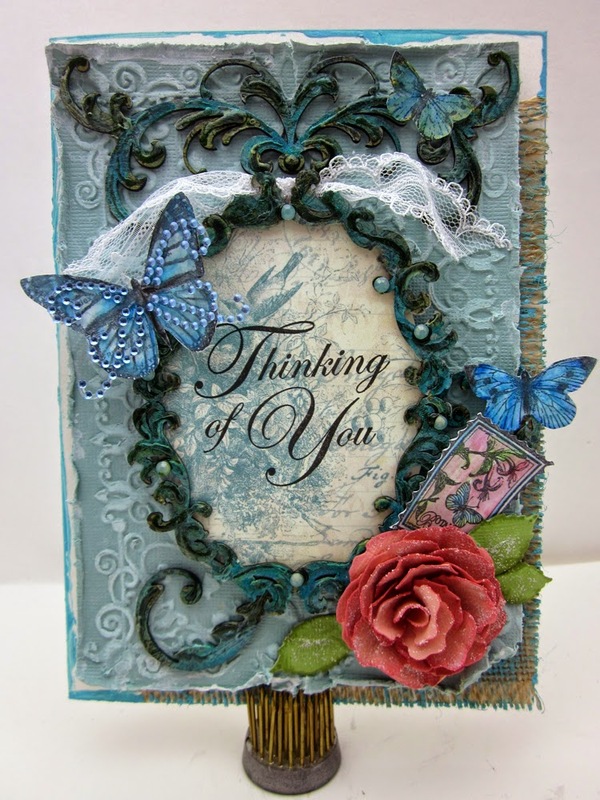 Arrange your rectangle and sentiment stamp on the card as shown and mount with foam tape. Add three sparklets to the right top corner of the card as shown. Tie a bow along the black rectangle as shown. To finish of the card and the bow stamp two wine glass stamps…color in the center with a bit of burgundy /pink ink and fussy cut out. Glue down to the center of the bow as shown.